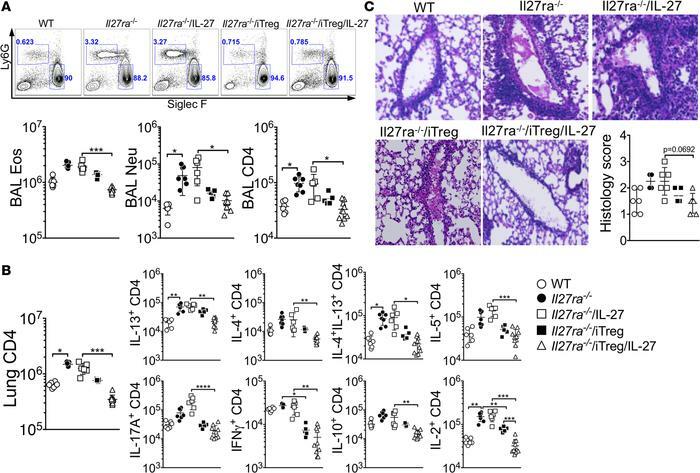 Transfer of WT Tregs into Il27ra–/– mice diminishes allergic airway inflammation after IL-27 treatment. WT and Il27ra–/– mice were sensitized with CA in alum adjuvant and intranasally challenged in the presence or absence of intranasal IL-27. In some experiments, 2 × 106 iTregs were transferred 2 days before antigen challenge. Mice were sacrificed 24 hours after the last challenge. (A) BAL cells were examined for Ly6G and Siglec F expression, and differential cell counts was performed by FACS. (B) Lung cells were stimulated ex vivo, and intracellular cytokine expression was determined. (C) H&E staining of the lung tissues are shown (original magnification ×20), and histology score was evaluated. The data shown represent the mean ± SD of 2 independent experiments (n = 6). Each symbol represents an individually tested mouse. *P < 0.05, **P < 0.01, ***P < 0.001, as determined by Kruskal-Wallis nonparametric test. BAL, bronchoalveolar lavage; Eos, eosinophils; Neu, neutrophils; iTreg, induced Tregs.